Did you know that the oldest species of almonds ever discovered were found at the 780,000-year-old archeological site Gesher Benot Ya’aquov, in the Dead Sea in Israel and they have been harvested in the eastern Mediterranean since 3,000 B.C. The Greeks were the ones who spread almond trees throughout this territory and later, the Romans introduced almonds throughout their Empire. Nowadays, the main producing countries are the USA, Australia, Spain, Iran, Tunisia, Turkey and Chile. Why Almonds are Good for Your Health? 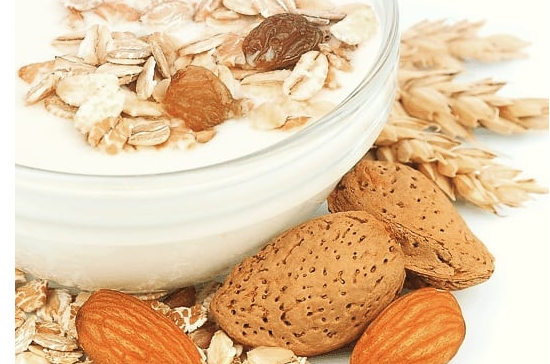 The consumption of almonds as part of a healthy diet may help in the maintenance of healthy blood lipid levels and to reduce the risk of heart disease. Almonds are high in fiber, vitamin E (α-tocopherol), riboflavin and minerals such as calcium, iron, magnesium, phosphorus, potassium, zinc, copper and manganese. Also, they represent a source of protein, thiamin, niacin and iron. In the mid-18th century, the Franciscan Friars brought the almond tree from Spain to California and they planted almond trees along El Camino Real (The Royal Road) from San Diego to Sonoma. In India, almonds are prescribed as a brain tonic in Ayurveda, a traditional system of medicine with historical roots in the Indian subcontinent. Also, bees are essential for almond growers to pollinate the trees and ensure the success of the harvest. In California, every spring, hives from beekeepers are rented to bring honeybees to the almond orchards.